One of the side effects of the brutal New England winters for us is dry skin. Every winter all four of my boys end up with eczema. One of the twins also suffers from keratosis pilaris which will often flare up during these colder months. While I too will battle dry skin, this year I had a big problem with my hands being extremely dry and even cracking and bleeding. So I am always on the lookout for natural skincare to help keep us all nicely moisturized. I have heard really good things about Skin MD Natural in the past so I was really excited to try it out. Unlike traditional lotions, this shielding lotion duplicates your skin's protective barrier thus protecting you from harsh irritants that cause dry skin in the first place. "Skin MD Natural uses a blend of natural ingredients in combination with significant recent scientific advances to hydrate and help heal dry skin without any greasy residue, harsh fragrances, or other potentially toxic ingredients. Conventional lotions simply attempt to replace lost moisture with artificial moisture.". The first thing I did was add Skin MD Natural do our bath time routine. So one by one as each boy got out of the tub (shower for the 6 year old) I would cover their bodies with some of this. I immediately noticed how smoothly it went on and I that I did not need to use a lot to get good coverage. Skin MD Natural boasts about being non-greasy and this is very true. There was no need for me to wipe my hands on a towel after applying. And I have to point out that the 6 year old who normally hates when I put any moisturizer on him, really liked this one. But I think the person who probably needed this the most was me. I mentioned how bad my hands were, I don't remember them ever being so dry and cracked before. So I started putting a nice daily coating on my hands that would quickly absorb in and within a few days I could feel the improvement. Now I just need to remember to keep putting it on every day! Skin MD Natural uses natural ingredients, does not use any animal products and is not tested on animals. However, they did not stop there. What also makes this product and company great is that they use eco-friendly manufacturing practices. Both the Skin MD Natural and Skin MD Natural + SPF 15 are manufactured in the USA using 100% solar power. Wouldn't it be awesome of more companies did this?! I really love that and I can only hope that more businesses start using renewable energy like this in the very near future. 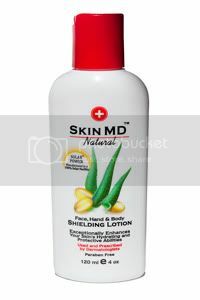 You can buy Skin MD Natural Shielding Lotion direct at SkinMDNatural.com, search for a local retail store or order from Amazon.com . One (1) winner will receive a full size 4oz bottle of Skin MD Natural Shielding Lotion. Visit SkinMDNatural.com, take a look around and tell me anything hat you learned there. - Share your dry skin woes with me and why you want to win this. - "Like" Skin MD Natural on Facebook. Please leave me your first name and last name initial to validate. This giveaway is open to US and Canada Residents 18+ only and will end on Tuesday, April 19 at 11:59pm EST. One winner will be chosen at random using Random.org and will be posted on the Winner's Announcement Page. Winner has 48 hours to claim his/her prize otherwise a new winner will be picked. Please leave your e-mail address in all of your comment(s) so I can contact you. I will not share your e-mail address with anyone, it will strictly be used to notify you if you win. Good luck! Please note that the opinions and views expressed in this review are my own and based on my personal experience with the product and/or company. You may encounter a different experience with this than I did. I received a sample for review. This post many contain affiliate links. I learned that discounts are given if one orders multiple bottles! I learned that dry itchy skin means your outer layer of skin is not protected or shielded any more. I learned that this product is not supposed to feel greasy like other brands to. I learned that conventional lotions can make your dry skin worse. I want to win as I love skin md lotion. I get dry skin and want to keep it soft and smooth. i learned that during and after menopause the body begins to produce less estrogen causing skin to become drier and lose its elasticity. I love that Skin MD Natural and Skin MD Natural + SPF 15 are manufactured using 100% solar power, free of animal products and animal testing! I have very dry and sensitive skin, so I'd love to try this. I follow you on Facebook (Jessica K). Just liked Skin MD Natural on Facebook. I learned that it can last 8 hours with one application. I would like to try this since my hands look terrible in the winter! I just "liked" you on facebook, I am looking forward to your future posts. I also am following your blog via email. I commented on your "Wordless Wednesday" post. I learned that CVS carries Skin MD! I would like to give this to my friend to try for her post radiation skin. I commented on your April 8th post: Disney African Cats Opens On Earth Day! My skin gets so dry at times that it cracks. I learned that it's Eco Friendly, Cruelty Free and Vegan. I "Like" Skin MD Natural on Facebook as Audrey F.
One thing i learned at skin md natural is that they use 100% solar energy in producing there products. Wow great company doing great things. My dry skin woes are my feet especially during winter. I can almost itch the skin right off if i'm not careful. I have tried many products but still have this problem every winter. Following green mommas pad on twitter via kevandjose as well as skin md natural. I like the fact that it is made in the US using 100% solar power. How eco friendly. I want to win this for my husband. His back and neck is so dry and scaly! I learned that SkinMD has sunscreen included so you do not need to apply sunscreen in addition to the product. I learned that Skin MD is vegan, cruelty free, and eco-friendly. They don't test on animals! i learned that i can find it at my local cvs!! !